2019 Fieldwork, curated by Maria Lux . Solo exhibition as Artist in Residence, Animal Remains conference, Sheffield Animal Studies Research Centre, University of Sheffield, April. 2020 As Kingfishers Catch Fire: Animalities in Artists’ Imagination, Limerick City Gallery of Art, Ireland, forthcoming April – June 2020. 2019 Cley 19: Borderlines, 14 th -century church of St Margaret of Antioch, Cley, Norfolk, July – August. Collaborative installation with Mike Dodd. 2019 Radical Landscapes: Innovation in Landscape and Language Art, Plough Gallery, Great Torrington, Devon, March – April. 2018 Cley 18: The Greater the Distance the Clearer the View, 14 th -century church of St Margaret of Antioch, Cley, Norfolk, UK, July – August. 2018 Inheritance, Norwich Castle Museum & Art Gallery, Norwich, UK, March – May. 2018 Remembering Animals: Rituals, Artifacts and Narratives in Contemporary Art, Main Art Gallery, CSUN, Los Angeles, USA, February – March. Catalogue: ISBN 978-0-692-06481-8. 2017 Members’ Show 2017, OUTPOST Gallery, Norwich, UK, November – December. 2017 In the Open, SIA Gallery, Sheffield, UK, September. 2017 Touching on Science, three-person exhibition with Juanjo Guerra and Geoffrey Lefever, at the annual symposium of the Centre of Excellence for Plant and Microbial Science (CEPAMS), Dunston Hall, Norfolk, UK, March. 2017 Co-Existence, at the Seeing with Animals conference, Eastern Kentucky University, Richmond, Kentucky, USA, March. Catalogue: ISBN 978-0-9987688-0-9. 2015 Matter. Place. An Other., Gallery 202, Northampton, September – November. 2015 Cley 15: Marvellous in Ordinary, 14th-century church of St Margaret of Antioch, Cley, Norfolk, July – August. 2015 What Does Art Add? : Figuring the More-than-Human World, City Without Walls (cWOW), Newark, New Jersey, USA, March – April. 2014-15 Arche Noah: Über Tier und Mensch in der Kunst, Museum Ostwall im Dortmunder U, Dortmund, Germany, November 2014 – April 2015. Catalogue: ISBN 978-3-925998-56-0. 2014 Ecce Animalia, Museum of Contemporary Sculpture, Orońsko, Poland, March – June. Catalogue: ISBN 978-83-85901-99-0. 2013 Cley 13: The Flight of the Spoonbill, 14th-century church of St Margaret of Antioch, Cley, Norfolk, July – August. 2013 Forever and Ever (four-person show), Town House Museum and Gallery, Dunbar, East Lothian, May – June. 2012 Screening at the Cosmopolitan Animals conference, Institute of English Studies, University of London, 26-27 October. 2012 Us and Them: Umwelten, Project Space, Melbourne, Australia, May – June. 2011 Animal Gaze Returned, Cass Gallery, London Metropolitan University, October – November. 2011 Salthouse 11: Ad limina, 15th-century church of St Nicholas, Salthouse, Norfolk, July – August. 2010 Standing Heat, The Front, New Orleans, USA, November – December. 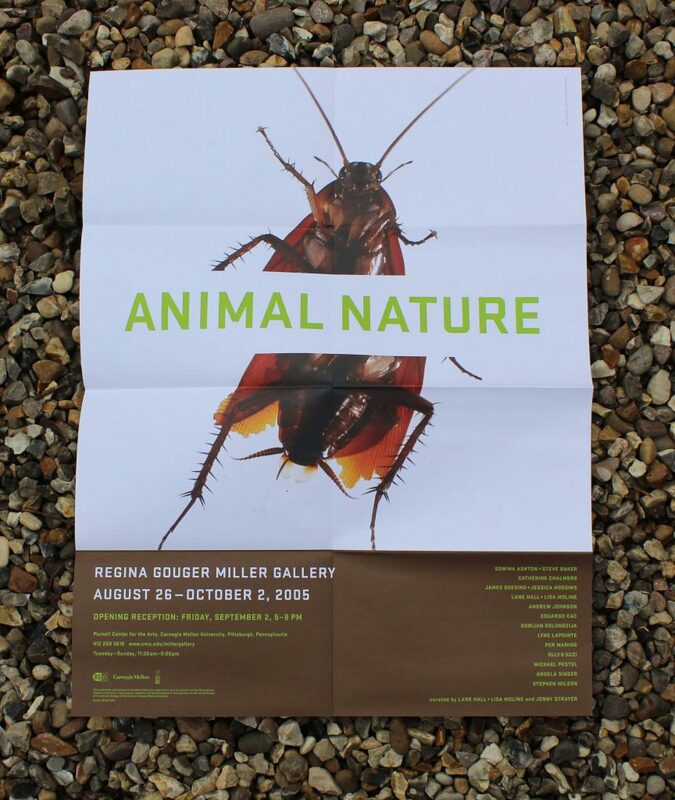 2005 Animal Nature, Regina Gouger Miller Gallery, Carnegie Mellon University, Pittsburgh, USA, August – October. Collaborative installation with Edwina Ashton. Catalogue: ISBN 0-9972053-0-4. 2017 Amanda Geitner, “Foreword,” in Steve Baker & Mike Dodd: Trees and Other Objects (Norwich: Singular Publishing). ISBN 978-0-9935572-2-4. 2016 Jane C. Desmond, Displaying Death and Animating Life: Human-Animal Relations in Art, Science, and Everyday Life (Chicago and London: University of Chicago Press), pp. 142, 152-54 and 169. ISBN 978-0-226-14406-1. 2015 L.A. Watson, “Remains to be seen: Photographing ‘road kill’ and The Roadside Memorial Project,” in Economies of Death: Economic Logics of Killable Life and Grievable Death, ed. P. Lopez and K.A. Gillespie (London and New York: Routledge). ISBN 978-1-13-880576-7. 2013 Jane C. Desmond, “Requiem for roadkill: Death and denial on America’s roads,” in Environmental Anthropology: Future Directions, ed. H. Kopnina and E. Shoreman-Ouimet (New York: Routledge), pp. 46-58 (esp. pp. 50-53). ISBN 978-0-415-51748-5. 2012 Julia Schlosser, “Anhalten, sehen: Die Körper überfahrener Tier in der Arbeit Steve Bakers,” Tierstudien, no. 2: special issue on “Tiere auf Reisen,” ed. J. Ullrich, pp. 84-96. ISSN 2193-8504. 2012 Giovanni Aloi, Art & Animals (London and New York: I.B. Tauris), pp. 132-34. ISBN 978-1-84885-525-0. 2011 Susan McHugh, “Stains, drains and automobiles: A conversation with Steve Baker about Norfolk Roadkill, Mainly,” Art and Research: A Journal of Ideas, Contexts and Methods, 4, no. 1: special issue on “Art and animality,” ed. R. Broglio, unpaginated. ISSN 1752-6388.